Instant Beauty Spa offers a wide variety skincare services and treatments. Our facial treatments offered are to address every skin concern from the relaxing spa facial to results-oriented peels, as well as dermaplaning, microneedling (mircochanneling), and eyelash lift and tint services. We are proud to utilize the following professional skincare lines in our treatment room as well as for retail sale: Skin Script and PCA Skin.Dermaplaning is an advanced exfoliation technique that utilizes a surgical blade to remove the cornified layers of the epidermis and vellus hair. It is very effective for low grade acne, skin wrinkling, hyperpigmentation, dry skin and aging skin. Benefits include softening of skin texture and tone, minimizing pores and congestion, reducing hyperpigmentation, skin brightening, collagen stimulation, reduction of fine lines, removal of vellus hair and excess oil. In addition, it aids in the optimum penetration of products and cell turnover. Not sure what type of skin you have? No problem! Let us help. Book a consultation and skin analysis and we will recommend a treatment plan and products customized for you. Instant Beauty Spa Signature Facial is a relaxing experience that includes one botanical cleanser, an enzyme exfoliation, a relaxing hand massage while the enzyme lifts dead skin, extractions if necessary, face, neck, shoulder and décolleté massage with nourishing natural oils, a luxurious treatment mask with a hand massage and moisturizer/SPF. Cleansers, enzyme and mask are customized based on skin type. Instant Beauty Spa Customize Facial is a deeply relaxing experience that includes two botanical cleanser, an enzyme/light peel exfoliation, a relaxing hand massage while the enzyme lifts dead skin, extractions if necessary, face, neck, shoulder and décolleté massage with nourishing natural oils, a luxurious treatment mask with a hand massage and moisturizer/SPF. Cleansers, enzyme and mask are customized based on skin type. Need a facial, but don't have the time? Try our Mini Facial, it is the perfect option for a quick pampered experience. This facial is a quicker version of our Signature Facial. The Mini Facial gives you all of the revitalizing treatments for your skin in half the time! Our Back Facial is target treatment facial designed specifically for the back. 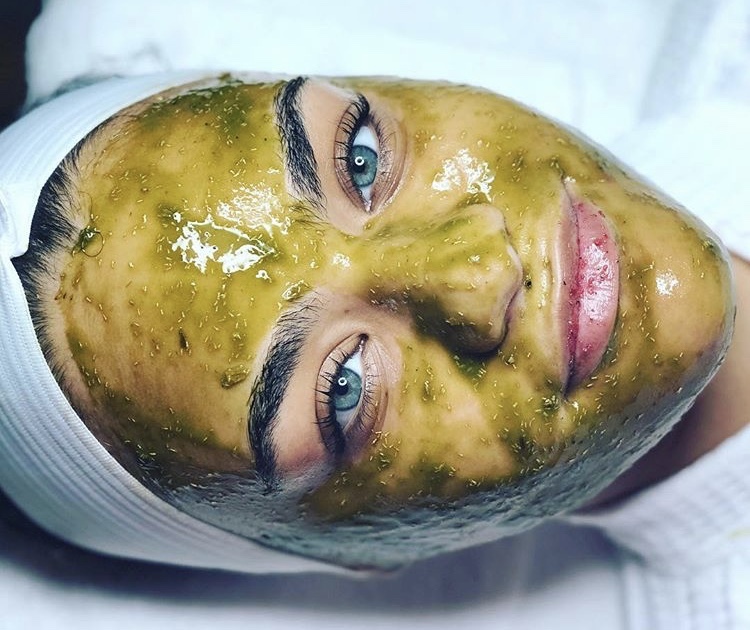 It includes one botanical cleanser, an enzyme exfoliation, a relaxing hand massage while the enzyme lifts dead skin, extractions if necessary, light gentle massage with nourishing natural oils, a luxurious treatment mask with a hand massage and moisturizer/SPF. Cleansers, enzyme and mask are customized based on skin type. Instant Beauty Spa can treat a variety of skin conditions with a customized series of 6 treatments. Conditions we can treat: acne at all ages, whether it is papular, pustular, hormonal, or congested with blackheads and/or whiteheads; hyperpigmentation concerns such as sun damage, age spots and melasma; textural issues, such as rough, patchy, hyperkeratinized skin and acne scarring; severely dry and dehydrated skin. Every treatment series begins with a consultation to determine skin type, personal habits and lifestyle. During the consultation, a professional home care regimen will be prescribed. Home care is a requirement for a treatment series and must be purchased during the consultation. At the end of the first visit, each subsequent visit will be scheduled approximately 7 days apart depending on the treatment. As these treatments are progressive rather than aggressive, you can expect little to no downtime. The peels we use in this series are single acid peels: 20% Lactic Acid, 30% Glycolic Acid and 10% TCA Depigmentation Peel with Kojic and Arbutin from PCA with Skin Script. The Dermaplaning Exfoliation treatment includes two cleanses, thorough skin analysis, degreasing (to remove excess sebum), dermaplaning procedure, treatment serums and moisturizer/SPF. The Dermaplaning Facial includes an enzyme exfoliation prior to the dermaplane procedure and a soothing gel treatment mask following. The Dermaplaning Facial treatment includes two cleanses, thorough skin analysis, a mild enzyme exfoliation, extractions if necessary, degreasing, dermaplaning procedure, treatment mask with soothing ice globe massage, treatment serums and moisturizer/SPF. Microneedling also known as Microchanneling is is the insertion of very fine short needles into the skin for the purposes of rejuvenation. The skin when stimulated through microneedling which initiates cell turnover to produce collagen and elastin naturally. Microneedling can improve the following: fine lines, wrinkles, acne scars, stretchmarks, and traumatic scars. Microneedling can be a solo service or can be added to any other facial treatment, especially dermaplanning. Price ranges depending on skin consultation and goals. Get gorgeous eyelashes instantly! An eyelash tint and lift is the perfect option for someone who wants to enhance the appearance of their eyelashes. An eyelash tint and lift darkens the color of your natural eyelashes, while providing a beautiful curl. These results last from 6-8 weeks and are a great low maintenance alternative to eyelash extensions.